Nursery Friends 9oz. Paper Baby Shower Hot/ Cold Cup 8ct. 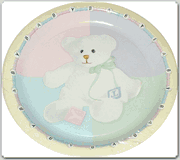 Precious Wonders Baby Shower 10" Square Paper Plates 8ct. Precious Wonders Baby Shower 7" Square Boys Paper Plates 8ct. Precious Wonder Baby Shower Postcard Invitations Girls 8ct. Precious Wonder Baby Shower Postcard Invitations Boys 8ct. Precious Wonders Baby Shower Announcement Cards Boys 8ct. Precious Wonders Baby Shower Announcement Cards Girls 8ct. Precious Wonders Baby Shower Jointed Banner 6ft. Baby Airways Baby Shower Green Beverage Napkins 20ct. Bundle of Joy Baby Shower Fringe Banner 6ft. Perfectly Periwinkle Blue Baby Polka Dot Invitations 8ct. New Baby Shower Plastic Fringe Banner 6ft. Baby Rocking Horse 3" x 4" Mini Favor Bags 18ct. Blush Stripes Baby Shower Buffet / Guest Napkins 16ct.